Moves are under way to help small and medium-sized enterprises (SMEs) piggyback on the financial reputation of their big clients so they can get loans more easily. The initiative was mentioned by Deputy Prime Minister Tharman Shanmugaratnam, who told an awards ceremony last night that such programmes are already in place among some multinational companies (MNCs) to help SMEs in their supply chain. He added: "We are seeing a move towards multi-party supply chain finance programmes, where banks are more willing to lend to SMEs that belong to a larger supply chain involving an MNC. Such programmes strengthen the creditworthiness of SMEs as banks consider them less risky when they have financially stable MNCs on their client books." And unlike traditional SME lending, which is based on the firm's credit, such programmes consider the fact that the company enjoys regular revenues from a client with a strong credit standing, said Mr Tharman, who was speaking at the World Entrepreneurship Forum. "This allows for better rates and possibly additional loan facilities compared to what the SME would obtain on a stand-alone basis. Our agencies are exploring how to raise awareness of supply chain financing and encourage MNCs in Singapore to adopt more multi-party supply chain financing programmes, given the win-win for MNCs and SMEs." 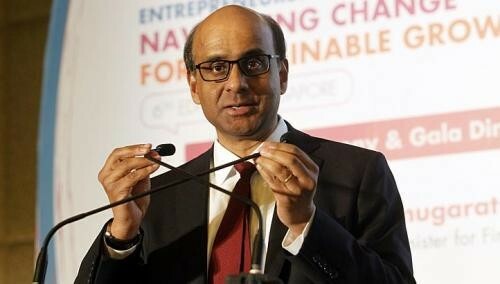 Mr Tharman added there is scope for increased partnerships between SMEs and large companies in overseas ventures. Multinationals often require highly specialised and customised services to improve their products andoperations in other countries, he noted, and local SMEs are well positioned to fill these needs. He cited Savant Degrees, a local start-up specialising in digital services. It was selected by personal care products giant P&G to develop a digital application that would boost productivity in its stores, starting in the Philippines. Six people were awarded accolades later in the evening. Among them was Ugandan Ashish Thakkar, 31, who won the Young Entrepreneur award. Mr Thakkar is the founder of the conglomerate Mara Group, which has many holding companies and employs more than 7,000 people in 26 countries. He started his first company, selling computers to family and friends, at the age of 15. Unreasonable Group chief executive Daniel Epstein, from the US, was given the Educator award. His firm provides entrepreneurs from around the world with mentorship and access to seed capital and skills training. Mr Richard Branson, the British founder of the Virgin Group, won the Serial Entrepreneur award. He did not attend the ceremony but gave a thank-you speech via video. Liberian President Ellen Johnson Sirleaf, who also did not attend the event, was given the Policy Maker award. Frenchman Jean-Baptiste Richardier, who co-founded Handicap International, was given the Social Entrepreneur award, while Jordanian Fadi Ghandour was the Business Entrepreneur winner. The World Entrepreneurship Forum is held in a different country each year. This is the second time Singapore has hosted the forum. It was last held here in 2011.